American Bar Association monitors report misdemeanor defendants in Nashville often aren’t told they are entitled to a lawyer even when their charges mean they could end up behind bars. 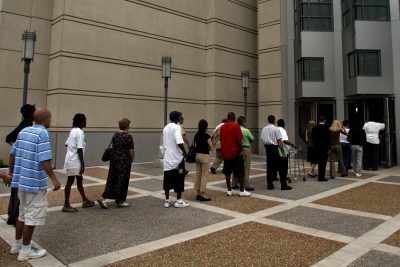 The scenes in Nashville’s Court 1A last year are included in an American Bar Association report examining what the organization sees as one of the most routine constitutional violations taking place in U.S. courts every day: the failure to notify indigent defendants facing misdemeanor charges that can carry jail time that they are entitled to a lawyer. The report, done by the association’s section on civil rights and social justice, was approved and released by the ABA’s board Friday afternoon. The report’s authors declined to comment on the ABA effort, saying that the document speaks for itself. “Volunteer lawyers repeatedly observed both judges and prosecutors violate indigent defendants’ right to counsel under Tennessee law,” the report states. Nashville District Attorney Glenn Funk did not reply to an inquiry sent to his office seeking comment on the report. The report points to a number of studies in recent years that had begun to better document the problem, including work the ABA had done in several states in 2006. “There is a shocking disconnect between the system of justice envisioned by the Supreme Court’s right-to-counsel decisions and what actually occurs in many of this nation’s misdemeanor courts,” it says. The report cites two Supreme Court decisions in establishing that many of those charged with misdemeanors are entitled to a lawyer. A 1972 case said that such lawyers were required even in misdemeanor cases, absent a “valid waiver of counsel” by the defendant. Thirty years later, the report stated, the court made clear that defendants being offered suspended sentences — deals that spare defendants immediate imprisonment so long as they meet certain conditions — were also due representation by a lawyer. In Nashville, the ABA had volunteer lawyers spend Sept. 12, 2016, in Davidson County General Sessions Court. The ABA described the effort as the launch of a national project to “review practices in misdemeanor courts in other states throughout the country.” In Tennessee, there are state provisions that make explicit the right to a lawyer, even for those facing misdemeanor charges. The defendants in the courtrooms monitored by the ABA were typically facing minor drug charges or driving with suspended licenses, offenses that could result in jail time. The report describes an assembly-line atmosphere, done almost entirely without the presence of defense lawyers. When a judge did turn up in Court 1A, she merely confirmed with the court clerk that plea deals had been signed, according to the report. Joseph Ozment, president of the Tennessee Association of Criminal Defense Lawyers, said the prosecutors are not looking out for the defendant’s rights. Ozment also blamed the judges overseeing the cases. Ozment said judges may allow the practice to lower their caseload and to dispose of cases quickly. Presiding Judge Gale Robinson in Nashville did not respond to a request for comment sent to him Friday through the state’s Administrative Office of the Courts. The report also states that the ABA’s observers did not see the prosecutor inform defendants that there is a waiver process if they couldn’t afford to pay fees or fines. The ABA lawyers spoke in detail with the woman who asked to see the judge and rejected a plea deal. A court bailiff overheard the ABA lawyers talking with the defendant. The bailiff then informed the defendant that she could go to the clerk’s office on a different floor of the courthouse and ask for a waiver that might lower the amount of the fine. The defendant told the ABA lawyers that during her previous appearances in Nashville’s courts, she was never told about the form even after telling the court she couldn’t pay the fines. Several ABA observers then went to the clerk’s office to obtain about a dozen of the forms to make them available in Court 1A. Nashville’s Clerk of Courts, Howard Gentry, did not respond to an inquiry for comment on the report’s findings.